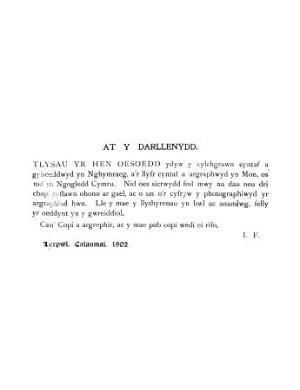 A quarterly Welsh language literary periodical intended to arouse interest in the Welsh language. The periodical's main contents were collections of old poetry and literature. Despite only publishing one issue, this was the first Welsh periodical. The periodical was edited by the poet and scholar, Lewis Morris (Llewelyn Ddu o Fôn, 1701-1765).